Orange County is a county in the state of Florida, in the United States. As of the 2010 census, the population was 1,145,956, making it Florida's fifth-most populous county. The county seat is Orlando. 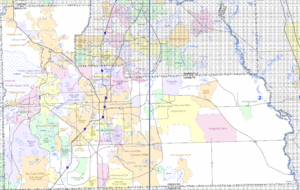 Orange County is the central county Orlando-Kissimmee-Sanford, Florida Metropolitan Statistical Area. The land that is Orange County was part of the first land to emerge from below the Early Oligocene sea 33.9–28.4 million years ago and is known as Orange Island. Orange County's Rock Spring location is a Pleistocene fossil bearing area and has yielded a vast variety of birds and mammals including giant sloth, mammoth, camel, and the dire wolf dating around 1.1 million years ago. In 1821, two counties formed Florida: Escambia to the west and St. Johns to the east. In 1824, the area to the south of St. Johns County became Mosquito County, and Enterprise was named the county seat. This massive county took up much of central Florida. Mosquito County was renamed Orange County in 1845 when Florida became a state. Several counties, such as Osceola, Seminole, Lake, and Volusia were carved out of Orange County. Orange County was renamed from Mosquito County for the fruit that constituted the county's main product. At its peak in the early 1970s, some 80,000 acres (320 km2) were planted in citrus in Orange County. The financial setbacks, not the first in the grove region's history, were too challenging for many growers. Economically destroyed, many walked away from the land and its obligations. Others awaited other opportunities. One of the region's major land owners and growers was the Tropicana company. They, however, also withdrew rather than try to come back from these seemingly endless generational decimation. With no realistic avenues for agricultural use of this rural land, and Florida's continuing strong population growth and its attendant needs (aided and supported by the success of nearby Walt Disney World and Universal Studios Florida), these areas began and continue to be swallowed up by growing housing developments. However, several packing facilities and wholesalers are still in Orange County. According to the U.S. Census Bureau, the county has a total area of 1,003 square miles (2,600 km2), of which 903 square miles (2,340 km2) is land and 100 square miles (260 km2) (10.0%) is water. There were 421,847 households out of which 30.81% had children under the age of 18 living with them, 43.50% were married couples living together, 15.65% had a female householder with no husband present, and 35.18% were non-families. 24.85% of all households were made up of individuals and 6.08% (1.71% male and 4.37% female) had someone living alone who was 65 years of age or older. The average household size was 2.64 and the average family size was 3.19. In the county, the population was spread out with 23.6% under the age of 18, 12.8% from 18 to 24, 29.8% from 25 to 44, 24.1% from 45 to 64, and 9.7% who were 65 years of age or older. The median age was 33.7 years. For every 100 females there were 97.0 males. For every 100 females age 18 and over, there were 94.9 males. The median income for a household in the county was $50,138, and the median income for a family was $57,473. Males had a median income of $40,619 versus $31,919 for females. The per capita income for the county was $25,490. About 10.0% of families and 13.4% of the population were below the poverty line, including 17.2% of those under age 18 and 9.4% of those aged 65 or over. In 2010, 19.1% of the county's population was foreign born, with 43.8% being naturalized American citizens. Of foreign-born residents, 68.9% were born in Latin America, 17.8% born in Asia, 8.1% were born in Europe, 3.0% born in Africa, 2.0% in North America, and 0.2% were born in Oceania. As of 2010, 67.43% of all residents spoke English as their first language, while 22.59% spoke Spanish, 2.44% French Creole (mostly Haitian Creole,) 1.23% Portuguese, 0.88% Vietnamese, 0.78% Indian languages (including Gujarati and Hindi,) 0.58% Tagalog, 0.53% Chinese, 0.50% French, and 0.45% of the population spoke Arabic as their mother language. In total, 32.57% of the population spoke languages other than English as their primary language. Orange County is served by the Orange County Library System, which was established in 1923. Before the opening of the Albertson Public Library in 1923, a circulating library maintained by the Sorosis Club of Orlando offered book lending services to patrons on a subscription basis. The Albertson Public Library was established with the collection of Captain Charles L. Albertson and the library was named in his honor. In 1924, the Booker T. Washington Branch of the Albertson Library was established to service the African American community of Orlando. In 1966, the current Orlando Public Library building was completed on the grounds of the Albertson Public Library. Currently there are 16 libraries within the Orange County Library system. Orange County, Florida Facts for Kids. Kiddle Encyclopedia.